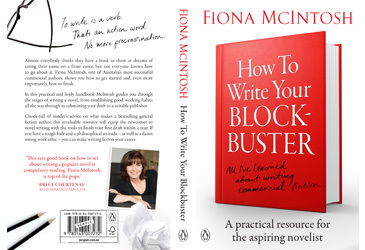 To my enormous delight, Fiona McIntosh will continue to run a Masterclass Writing Course. I can think of no writer in Australia, or for that matter elsewhere, who will do so with a more professional aptitude and sheer pizzazz! Go for it writers, it will change your life! – Bryce Courtenay, September 2012. The McIntosh Signature Commercial Fiction Masterclass now has a dedicated site which includes the signature 5-day masterclass and her 3-day weekend mini masterclass. The signature event is five intensive days with fiction writer, Fiona McIntosh. It is designed for aspiring and emerging writers of commercial fiction who have done the writing classes, read the writing books and are still looking for inspiration and that elusive catalyst that propels them toward publication. It is suitable for a beginner as Fiona will build from the fundamentals all the way through to the more subtle areas of storytelling. However, nervous beginners may like to look at the less intensive 3-day mini masterclass held amongst the vines of the Clare Valley in SA’s mid north. Fiona will challenge you through the week so bring your arsenal of creativity, imagination, passion and above all energy. This is about preparing for success with your writing and she will show you how to overcome the traditional insecurities and inhibitions that plague new writers and hamper their power to move forward. ‘I don’t claim that my masterclass is the best and the only one to consider. I’m biased, of course, and I know how much I give to the writers who come to my masterclass. I also have a track record of success, not only with my own books but with the writers enjoying success with the major publishers both in Australia/NZ and increasingly overseas into foreign translation, who have been through the McIntosh Masterclass. I do recommend that if you are considering taking a writing workshop of any kind that you do your research beforehand. There are plenty of people out there offering to help you with your novel writing but they may have little or no track record in the publishing industry. If they claim to be published, check that person out fully. Who publishes him or her? You really do want one of the major publishers to be behind anyone who is claiming they can teach you about writing novels and the publishing industry. If they are self-published or published through a firm that they have paid to publish them, that should clue you. If their name is not up there amongst the regular and popular sellers in this country, this may not be the most experienced, most accomplished or even the most knowledgeable writer to be your guide. Choose with care. ‘Let me add that I understand my masterclass is not an insignificant outlay, but it is a genuine investment in yourself and your writing. It will prepare you fully for the journey of the novel. Cheaper ones may promise you all sorts but just be wary and do your homework.’ Fiona 2019. All formats of Masterclass are booked out for 2019. April 2020 has one place remaining. Please enquire for the remaining places for Mini Masterclass 2020. There are no masterclasses scheduled yet for 2021.